Comments Comments Off on Under the Boardwalk! 28 September 2018, Comments Comments Off on Under the Boardwalk! 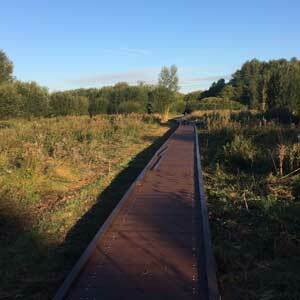 No, not an old song by The Drifters; at Foxearth Meadows nature reserve, we have a new boardwalk! This is an exciting development, as it opens up the public footpath across the site, which has previously flooded in winter. It will now be open year-round, enabling visitors to get much closer to the different habitats on the site without disturbing the wildlife. The boardwalk was planned and designed by our Foxearth Meadows Ranger, Mark Prina, and part-funded by Essex County Council, whose contractors performed the installation. The boardwalk is made of recycled plastic, meaning less plastic being lost into our rivers and oceans. The plastic will last much longer than wood and doesn’t leach chemicals into the soil. Passing through an area of tall vegetation, the boardwalk will offer visitors an up-close-and-personal view of the fantastic diversity on the Foxearth Meadows reserve. Keep your eyes peeled for details of the official opening event, and let us know if you’re going to be in the area—we’d love to give you a tour!